We are excited to announce support for replication of Hyper-V virtual machines (managed by System Center VMM or not under System Center VMM management) to premium storage accounts in Azure. We recommend that you replicate I/O intensive enterprise workloads to premium storage which provides high IOPS and high disk throughput per VM with extremely low latencies for read operations. At the time of a failover to Azure, workloads replicating to Premium storage will come up on Azure virtual machines running on premium storage and achieves high-levels of performance, both in terms of throughout and latency. A premium storage account: When you replicate your on-premises virtual machines/physical servers to premium storage, all the data residing on the protected machine’s disks is replicated to the premium storage account. A standard storage account: After the initial phase of replicating disk data is complete, all changes to the on-premises disk data are tracked continuously and stored as replication logs in the standard storage account. Copy frequency of 5 minutes or 15 minutes (configured as a setting in Replication policies) is supported for premium storage. This is based on the number of snapshots per blob (100 snapshots per blob) supported by premium storage. Ready to start using ASR? 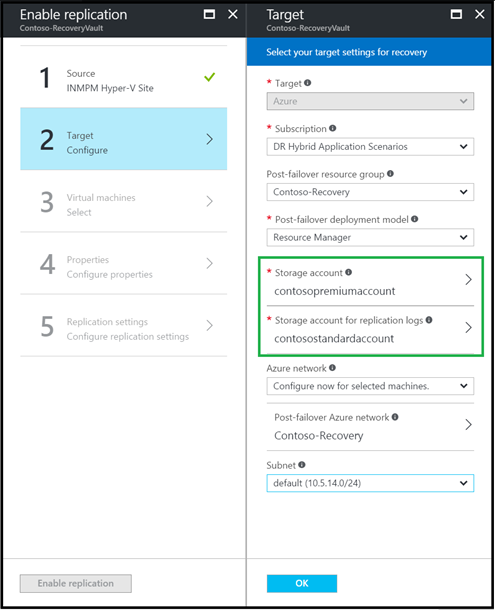 Check out additional product information, to start replicating your workloads to Microsoft Azure using Azure Site Recovery today. You can use the powerful replication capabilities of Site Recovery for 31 days at no charge for every new physical server or virtual machine that you replicate. Visit the Azure Site Recovery forum on MSDN for additional information and to engage with other customers, or use the ASR UserVoice to let us know what features you want us to enable next.